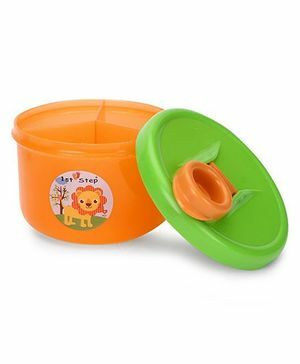 This Milk Powder container from 1st Step has been specially designed to hold per-measured quantities of baby milk powder for use throughout the day. A useful product while on the go but you have to shake it really well each time you use or else the milk powder sticks on to the container. The container is just perfect for outing with your little one. The three partitions make it easy to carry different cereals/ formula in measured portions. Must buy! Good product. However, the compartments are small. Quality is good. how much scoop it can fill in a single compartment .? it is much smaller that what v might think by looking at the pic. but u will love the product. u can take 3 portion while travelling. good product to carry during traveling size is small so can easily fit in your purse I have ordered all 3 colors ? ?